Mar. 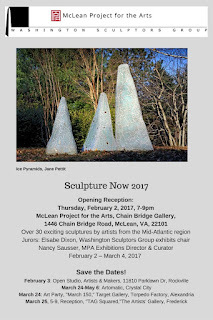 25 5-9 pm Reception, The Artists Gallery, Frederick Md. Can't make the reception? Be sure to visit the Activity Center at Bohrer Park before February 20 to see Love & Harmony, featuring works by Gwendolyn Aqui-Brooks, Susan Davis, Cynthia Farrell Johnson, Jenne Glover, Karlisima Rodas--Israel, Patricia Zannie, and Helen Zughaib. 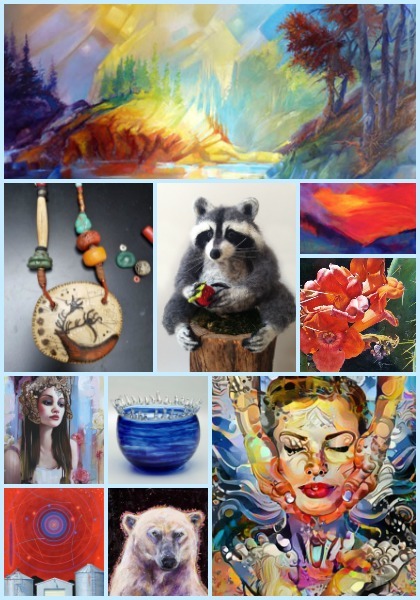 The City of Gaithersburg presents a mixed media exhibition featuring the works of Cynthia Farrell Johnson, Sandra Davis, Jenne Glover, Gwendolyn Aqui-Brooks, Patricia Zannie, Helen Zughaib, and Karlisima Rodas-Israel. The exhibit is on display through February 20, 2017 at the Activity Center at Bohrer Park, 506 S. Frederick Avenue in Gaithersburg. Viewing hours are Monday through Saturday from 8 a.m. to 9 p.m. and Sunday from 8 a.m. to 5 p.m. Guest Curator Cynthia Farrell Johnson has assembled a group of local artists whose bright and vivid work captures “Love & Harmony” with interpretations of nature, relationships, spirituality, hope and transformation through various media. Cynthia Farrell Johnson is a fan of vibrant colors. Her works in gouache and acrylic have been inspired by the people she met and places she lived during 25 years of globetrotting as a U.S. diplomat. Learn more about the artist at www.cfjfinearts.com. Sandra Davis is a graduate of the Art Institute of Pittsburgh, where she received a degree in Commercial Art. She started working with paper in 1996, creating images of clowns as a gift for her mother. Her current work focuses on African American history and icons. View her works at www.imagerybydavis.com. 3rd and Independence St. S.W. at 10 a.m. According to the Washington Post, more than 100,000 will attend the Women's March on Washington. This is turning out to be a major event you won't want to miss and I hope you will celebrate with me by coming and displaying the YELLOW TAPE To Stop Gun Violence. There are many important reasons why women are marching and putting an end to gun violence is at the top of the list. We need to SHOW it and the black and yellow tape is a great visual that will really stand out in a crowd. The YELLOW TAPE PROJECT supports the efforts of all Gun Violence Prevention groups and individuals, so please help spread the word to all your contacts and ask them to join in. P.S. I'll be rolling some this Sat. and Sun. afternoon if anyone in the D.C. area wants to join me. It's more fun to do it together! Just give me a call and let me know when it's good for you. TIME TO CONNECT IS NOW! This year's conference is themed Connect! It offers an unparalleled opportunity to develop friendships and collaborations with women artists, curators, and art historians from around the country. I encourage every WCA member to join us in New York from February 15-18, 2017. This will be our 45th year convening as an affiliate organization of the College Art Association (CAA) and our 11th as a founding partner of The Feminist Art Project. Make sure to purchase your WCA Connect! conference package by January 14 for Early Bird rates and to book your hotel by January 18. We worked hard to keep both the package and hotel costs reasonable so more members can join us. And, as my WCA director Margaret Parker recently shared in an email — "come if you can and give if you can" — please support the Lifetime Achievement Awards online campaign by following this 'gofundme' link. to feature and promote in the coming months. you are invited to submit an application for consideration. Alex Katz: Black and White explores the artist’s lifelong interest in stripping color out of his prints, and his attempt to replace sensual pleasure with intellectual design. Design versus color has been an artistic debate that goes back to the Renaissance. Similar to the art of Renaissance Florence, Katz’s prints are all about design, and are based on drawing, ideas, and the structure of things. JOIN US AND BRING YOUR FRIENDS - EACH ONE BRING ONE! RSVP to Marilyn Hayes by email: hayesarts@yahoo.com by Wednesday, December 9, 2015. Friends & significant others welcome. Include number of people attending and what food or drink you plan to bring in your response email. Please do not RSVP by phone. Bring something from the list below or bring some other tasty dish. Juice, coffee, tea, cream/half and half, quiche, breakfast dishes, pastries, breads, muffins, bagels, jelly, cream cheese, spreads, fruit, fruit salad, cheese and or any other goodies you can think of. Bring serving dishes for food. Don’t bring paper/plastic products. Volunteers Needed – Please email Marilyn if you can help at hayesarts@yahoo.com !! Available to help set up or clean up before or after the brunch? Want to contribute to the multicultural holiday decorations? Tell Marilyn when you RSVP. Exciting news! I've joined a very talented group of artists who open their studios once a year and put on a great tour. In past years, I've gotten many great gifts here. This is your chance to see the inside of the studio where most of my art is born! The art is hung, the lights are up, the wassail's brewing and the place has never looked so good! The barn and sculpture garden are ready for your visit. We'll have coffee, tea, wine and snacks, so come for a visit! Vermont slate and stone features a prominent place in my art this season. Just up 270, the Middletown and Pleasant Valleys of central Maryland are home to a wealth of professional artisans. 13 studios featuring 16 artists will open for the annual Valley Craft Network Studio Tour on November 19 & 20 from 10-5 pm. 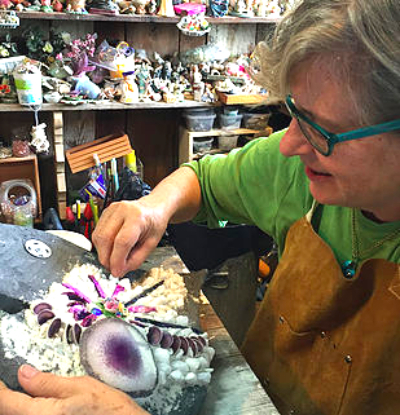 In its 35th year, Maryland’s oldest studio tour is free and open to the public. One of those studios is an 1825 German Bank barn where I create my art. For additional information and the brochure with a driving map, go to www.valleycraftnetwork.org. 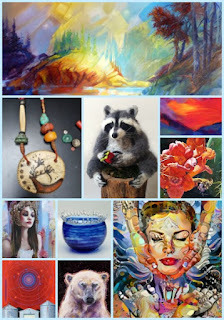 Find pictures of our art on Facebook and Pinterest. 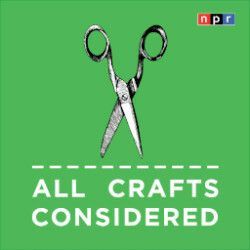 NPR headquarters is located at 1111 North Capital Street, NE, Washington, DC, 20002, a short walk from either the NoMA-Galludet or Union Station Metro stops on the Red Line. The Women's Caucus for Art in partnership with Ceres Gallery in the Chelsea district of New York City announces a call for art for the exhibition 'Wage On! Women, Art, and Money' from January 31-February 25, 2017. We seek works that explore the current economic climate and its impact on wages, female identity, and lives of women both in and beyond the art world. Helga Christoffersen of The New Museum will jury the exhibition. Share your art with us and the world! Art Works may be broadly interpreted from a political, personal, or formal context in any media. Self-identified women artists at all stages of their careers are encouraged to submit works on this important theme. WAGE ON! Women, Art, and Money will be an integral part of the 2017 Women's Caucus for Art annual conference held in New York City from February 15-18, 2017 that includes three days of panels, tours, workshops, networking events and the WCA Lifetime Achievement Awards. The exhibition extends key themes established in 2016 by the Minnesota Women's Caucus for Art's "The Women and Money Project." Juror Helga Christoffersen is an Assistant Curator at the New Museum in New York where she was part of the curatorial team for 'The Keeper' (2016), 'Nicole Eisenman: Al-ugh-ries' (2016), the third New Museum Triennial, 'Surround Audience' (2015), and 'Here and Elsewhere' (2014). She has curated solo exhibitions with Cally Spooner, Eva Papamargariti, Leonor Antunes, Lili Reynaud-Dewar, David Horvitz and Hannah Sawtell. Previously she was Assistant Curator of the 55th Venice Biennale, 'The Encyclopedic Palace' in 2013 and coordinator of the Danish Pavilion at the 54th Venice Biennale in 2011. Currently she is working on upcoming solo shows of Pipilotti Rist and Cheng Ran. The Women's Caucus for Art - District of Columbia Chapter has issued a call for entries for a juried show that opens on December 2, 2016 at Artists and Makers Galleriesin Rockville, MD. 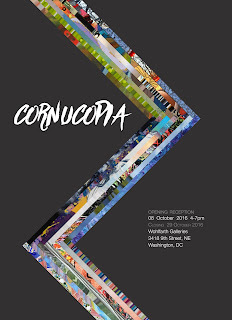 Rebecca Cross, owner of the Cross MacKenzie Gallery in Georgetown, will jury the show. Women artists working in all 2D and 3D media may submit up to three works of art by midnight, November 3, 2016. Juror notification is on November 16, 2016. The show will run through December 20, 2016 with an opening reception on December 2, 2016 from 6-9pm at Artists and Makers Galleries, 11810 Parklawn Drive, Rockville, MD (Rear Entrance). All accepted work must be wired and ready to hang. All sculpture must be moveable, 75lb. maximum weight. Pedestals will be provided unless a special type is needed. Upon acceptance there will be a $45 per artist hanging fee to be paid once work is juried into the show. Non-members must join to have their juried work in the show. The commission for artwork sold in the gallery is 25%. Using this link: http://www.entrythingy.com/d=wcadc.org#show=3080 submit up to 3 jpgs, 300dpi, approximately 4" x 6". Any work submitted must not have been in a WCA-DC show in 2015/2016. Artists will be notified of acceptance by email. Be advised that Artists and Makers Galleries does not carry insurance. Individual artists must self-insure if they want insurance. The women in Bonnie MacAllister's portraits gaze confidently out at the world. Her fine, colorful embroidery shows their optimism and potential. MacAllister's embroidery has garnered attention in exhibits, shows, and articles in Philadelphia, Atlanta, and Washington, D.C.Now she's received statewide recognition, winning first place in the mixed media adult category in the Art: the Universal Language art contest for Pennsylvanians with disabilities. The contest is collaboration between the Department of Human Services, The Arc of Pennsylvania, Pennsylvania Mental Health Consumers' Association, Pennsylvania Statewide Independent Living Council, and the Pennsylvania Council on the Arts. "Having disabilities gives people superpowers in art," said MacAllister, an income maintenance caseworker in Philadelphia. "Van Gogh had visions that no one else could see." MacAllister's grandmother had taught her embroidery and knitting many years ago, but MacAllister took up embroidery in earnest in 2012. "I used to paint and use a lot of potentially toxic materials. My husband had cancer, so I found a new way of expressing myself without toxic materials," she said. Her husband survived cancer and MacAllister realized that embroidery is lighter weight and easier to transport than painting. It's also therapuetic, MacAllister said. "I feel like it's healthier. I equate it to doing yoga. It's a mind and spirit as well as a physical action." The Delaware Art Museum displayed one of her paintings, but she has had much more response to her embroidery, she said. Her wax and oil paintings were more abstract, while the embroidery pieces are portraits, she said. I depict a lot of young women in different cultures: Michelle Obama, a quincinera, Malala. A lot of people across cultures, not just the U.S.," she said. "A lot of the people I'm doing the portraits of are children I worked with or know from Ethiopia or Philadelphia, people who have inspired me or influenced me to think about their futures." For her art, MacAllister starts with raw wool from farmers and herders. She stretches and spins it into yarn on a handmade spinning wheel from a nonprofit in Tanzania. Then makes garments, bracelets, and felted fabric that she uses to embroider. 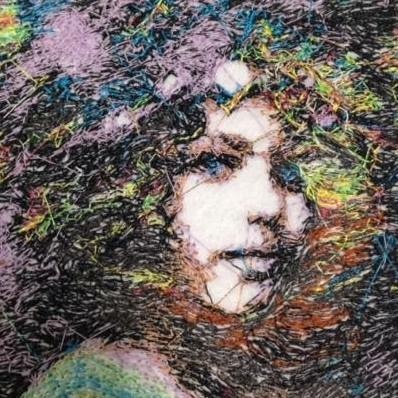 To create an embroidered portrait, MacAllister starts with a line drawing, then transfers it onto felt, then crafts a colorful image using embroidery thread. It takes her approximately a month to create a 4 x4 inch or 6 x 6 inch embroidery portrait. "That's the way I process stress is to turn it into creative projects," she said. "I have those things that help me stay relaxed and that allow me to stay happy every day." Before coming to DHS, MacAllister had a long career in teaching and in the arts and culture non-profit world. She taught with Teach for America for a year and was awarded a Fulbright-Hays grant to study history, culture, and migration for five months in Ethiopia. She was part of team of 14 American teachers who wrote the national curriculum on how to teach Ethiopia. She taught French and English in charter schools and a middle school, but always had an interested in civil service, she said. 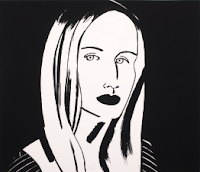 MacAllister has shows coming up at the Wohlfarth Galleries in Washington, D.C.; iMPeRFeCT Gallery in Germantown, and Philadelphia Open Studio Tours East of Broad at the CultureWorks 1315 Walnut Street, Suite 320. In the world of science as in much of life, seeing is believing. In the world of art, more often the reverse is true: believing is seeing. In the studio an artist borrows from her own imagination and vision, whether from a very personal inner world, or from the material world around her. Starting with a blank canvas, a lump of clay, or a found object, and drawing on her own life experience and beliefs, the artist transforms her vision into art, sharing her truth with others. 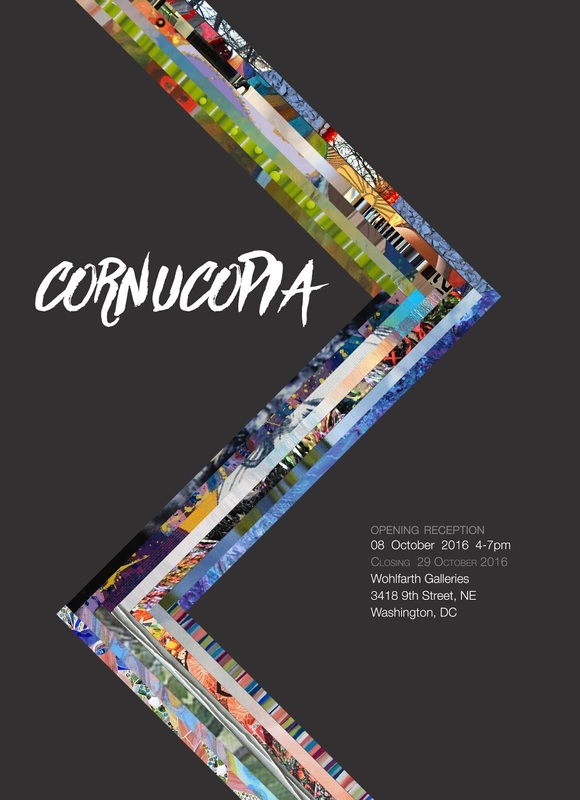 This juried exhibition of WCA/DC members’ work affirms their belief that art can be seen all around us. The Women’s Caucus for Art - District of Columbia Chapter has issued a call for entries for a juried show that opens on December 2, 2016 at Artists and Makers Galleries in Rockville, MD. Rebecca Cross, owner of the Cross MacKenzie Gallery in Georgetown, will jury the show. All accepted work must be wired and ready to hang. All sculpture must be moveable, 75lb. maximum weight. Pedestals will be provided unless a special type is needed. Upon acceptance there will be a $45 per artist hanging fee to be paid once work is juried into the show. Non-members must join to have their juried work in the show. The commission for artwork sold in the gallery is 25% Using this link: http://www.entrythingy.com/d=wcadc.org#show=3080 submit up to 3 jpgs, 300dpi, approximately 4” x 6”. Any work submitted must not have been in a WCA-DC show in 2015/2016. Artists will be notified of acceptance by email. Be advised that Artists and Makers Galleries does not carry insurance. Individual artists must self-insure if they want insurance.